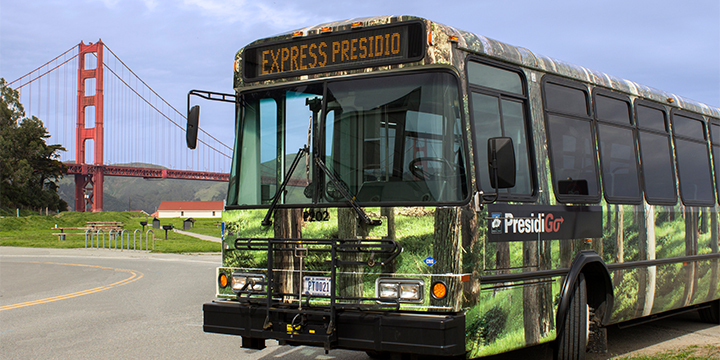 The free PresidiGo Shuttle system welcomes park visitors, residents, and employees with fully accessible shuttles and bike racks. There are two PresidiGo Shuttle services, each with different policies and guidelines – Around the Park and Downtown. The Downtown express route make stops at the Presidio Transit Center on the Main Post, the Letterman District, Union Street/Van Ness Avenue, Embarcadero BART, and the Transbay Terminal. The shuttle operates from 5:45 am to 9:30 pm on weekdays and 10 am to 7:30 pm on weekends. On weekdays, during the evening commute (leaving the Presidio only) from 4-7:40 pm, a valid MUNI Passport (not a MUNI Fast Pass) is required. No pass is required on weekends. It’s free for Presidio Employees and Residents every day with an appropriate boarding pass. Connecting service to Caltrain is available. The Downtown PresidiGo does not operate on federal holidays. The Presidio Hills Route is a bi-directional route serving the Letterman District, Main Post, Inspiration Point, Washington Boulevard, Baker Beach, and Public Health Service District. Both routes originate at the Presidio Transit Center and connect with MUNI and Golden Gate Transit at several locations. The shuttle runs on weekdays from 6:30 am to 7:30 pm. In operates on weekends from 11 am to 6:30 pm. Around the Park operates on a limited weekend service schedule on federal holidays.